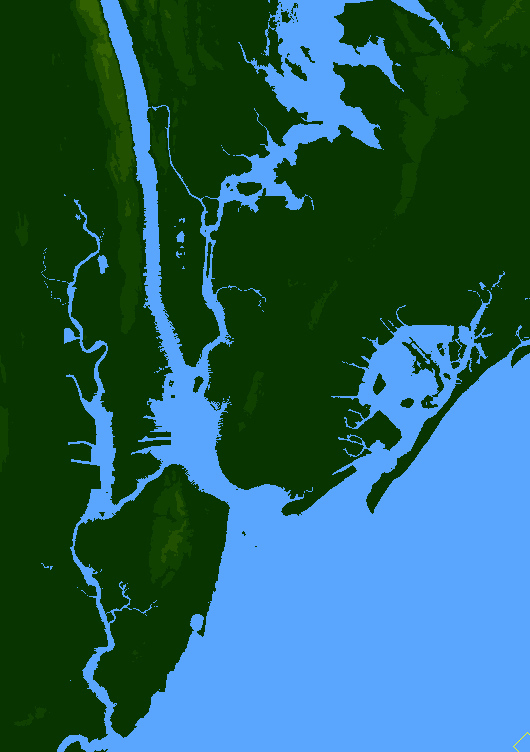 Here's a new map of the New York City area. The scale is 40 metres per tile. The map should be easy to scale down in GIMP if a smaller size is desired; or if there's enough demand I can upload smaller versions here. This was created from the USGS data available here -- which is so detailed that one could, as far as I can tell, make an accurate map at a resolution of 3 meters per tile! There's already a map of NYC on the maps website, but those who desire a more detailed map -- or indeed the entirety of Staten Island -- may like this one. The files disappeared from simutrans-germany for some reason -- I've updated the links so they should be live now. May I ask you kindly to publish the map with a free data format? Not as a .rar? Depending on the version of rar I can't unpack it. What about gzip or 7z or the like? thanks a lot for your quick reaction! What a wonderful map! You spoiled my autumn! Thank you, carlbaker! It is now available on Simutrans Maps, plus an honourable mention in the Simutrans blog. May it spoil some more autumns! You can publish maps as rle encoded bitmaps since ages. Those are much much smaller than ppm. Thanks, I had no idea -- I'll keep that in mind for future maps. 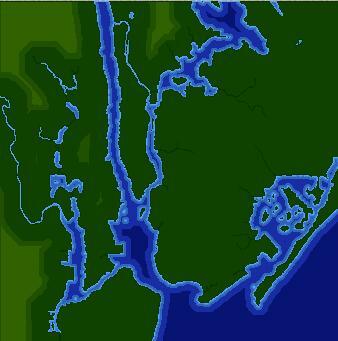 One criticism - you can't build a bridge over any of the waters surrounding Manhatten ala real NYC...Apart from that this map is beautiful! Also i've found a work around! Here's an alternative version of the above heightmap, which I've been working on for a future project. This doesn't replace the previous heightmap -- rather I think it's a matter of taste which you'll want to use. This one puts Manhattan on a straight vertical line, whereas the previous one respects the normal geographical layout (in terms of compass points). Yes, this map is great. Thank's for the work! Now it's possible to construct the new york city road grid. I'm only missing the water depth.